Twelve teams are slated to participate in the second annual Bowl for Mercy held in Chesterfield, Missouri at Brunswick Zone on Tuesday, May 17. The event will feature an inspiring address by a Mercy graduate in addition to two hours of bowling from 6:30 p.m. to 8:30 p.m.
Current St. Louis Mercy residents will be on hand to serve as lane hosts to the participating teams. The bowlers will enjoy refreshments and friendly competition, including individual and team prizes and raffles. Top prizes will be awarded after the bowling session in the following categories: Highest Team Game Score Overall (1st and 2nd place); Highest Individual Game Score Overall (top male and top female); Highest Number of Strikes; Lowest Individual Game Score Overall; and Social Media Prize. Mercy is still accepting Bowl for Mercy registrations. “Come join us to bowl with a purpose, so more girls can walk in freedom!” said Hobar. 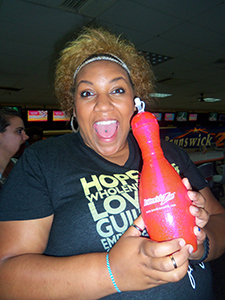 If you are unable to bowl, but would still like to give, please click here. For more information on future Mercy Multiplied events in your area, please visit Mercy’s EVENTS LISTING.